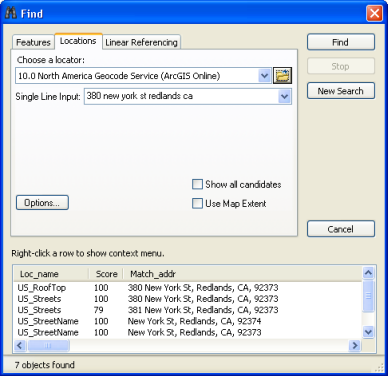 The Find tool allows you to search for locations using an address or place-name, to find features that match particular attribute values, and to find locations using linear referencing. For example, if you are trying to find Afghanistan on a map of the world, you can enter Afghanistan or just Afgh in the Find tool, and you'll get a list of the features from layers in your map that contain that search string in any of their attributes. Click the Find tool on the Tools toolbar. The Find dialog box appears. You can use the Find tool to generate a list of matches. Once the results of Find are displayed, you can navigate to each feature. Click an entry in the results list to flash it on the map (if it is within your map extent); double-click to pan to it (center the map on its location); or right-click to access a shortcut menu of many operations you can apply to your Find results—for example, to add a graphic marker or callout label at the place, create a spatial bookmark, or add it to a list of your favorite places. If you have selected multiple entries in the list, all the context menu commands work on the selected items. Using the Geocoding toolbar—An alternative way to find addresses and place-names is to use the Geocoding toolbar. You can use attribute values to find features whose attributes match your specified value. Click the Find tool to open the Find dialog box and click the Features tab. Enter the value you wish to find. For text searches, you can specify a subset of characters in your search. For example, Dall will find matches such as Dallas, Kendall, and Dallam. Identify the layer(s) to be used in your search and whether or not all fields or a specific field will be used. Optionally, check the Find features that are similar to or contain the search string check box. When checked, the searching capabilities of the Find operation will use a LIKE operator rather than an EQUALS operator. This is useful when you don't know a specific spelling or want to enter a much longer or complete find text string. This option works only with fields defined as text or strings. Optionally, specify a field to search. Click the Find button to find and work with the results. You can use Find to find address and place-name locations. If you are using the default locator service from ArcGIS Online or another locator service on the Web, you will need an Internet connection to use the Find tool. Click the Find tool to open the Find dialog box and click the Locations tab. Identify the locator you want to use. By default, the ArcGIS Online locator will be used. Often, however, organizations will create and use their own locators for their specific area of interest as well as to ensure that the most up-to-date, trusted information is included in their locator. Enter the place-name or address that you want to find. Click the Find button to search for and work with the results. You can use the Find tool to locate events and observations with linear referencing onto line features. Linear referencing is the method of storing geographic locations by using relative positions along measured linear features. Find the point location of measure 12 along a route. Locate the point 4 units east of measure marker 10 along a route. The observation starts at measurement 18 and ends at 26. The line starts at measurement 28 and continues for 12 units. Refer to Finding a route location for the steps to use Find for linear referencing.